1) The paper summarises a keynote presentation given at the FIG Working Week in Rome, 8 May 2012. A better public perception of the surveying profession requires a campaign to improve the general image of the profession and raise awareness of its fundamental contribution to key socio-political issues and global megatrends. Regarding environmental issues, such as energy provision, climatic changes, demography, bio-diversity, societal modernisation, disaster risk prevention and security policy, surveyors have to act as change managers. The global footprint of the surveying branch has to be pointed out through pro-active communication. This paper addresses the new professional orientation for surveyors in Germany and describes DVW´s integrative role as a platform and a stakeholder for the entire geo-community, shaping networks between politics, government, administration, private economy, industry, geo-business, science, research, education and other NGO´s. Surveyors are engineers with a technical and mathematical background. It`s beyond doubt that we enjoy a good reputation by doing our job well and precise. However, it`s also a fact that surveying is a service discipline in a value-added chain. Thus, usually surveyors are not identified with the final product – in contrast, for example, to a civil-engineer and the bridge, he has constructed. Hence, we have to improve our communication and promotion capabilities so as to allow for a better public understanding of the essential role of surveyors. In regards to our serious “young blood problem” and generally the lack of engineers in Germany, which threatens to impact seriously on the innovative power of our economy, DVW, in collaboration with our sister organisations, has developed an image campaign for geodesy, geo-information and land management and their protagonists. The main goal consists simply of making engineering sciences, especially in the field of surveying, again more attractive for young people, who – following a trend over the last decade – have turned towards study of courses with better income potential. Essentially - growing demand cannot be met by the available alumni. Predominantly, this article is concerned with specific German experiences pertaining to how to shape environmental and societal change through surveying activities and how to support those processes through a strong professional association. Further, it is assumed that many countries face similar challenges. In this respect the presented approach may give helpful suggestions for applicable solutions. 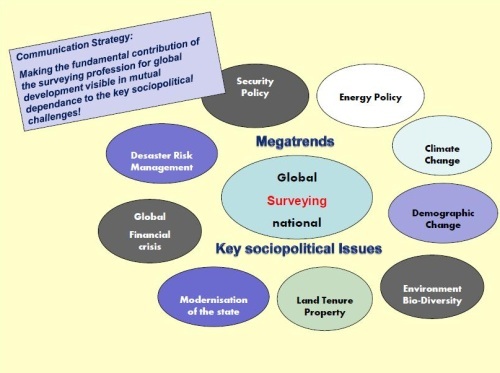 The key for a better understanding is to make the fundamental contribution of the surveying profession for regional, national and global development visible in regards to societal megatrends and the key socio-political issues. The allegory of the two stone masons makes the context clear: a traveller comes along and asks the first stone mason what he is doing there. His answer: I hew stones. The second mason, however, answers: I am working on a cathedral! A surveyor`s affair? Yes, of course, because it`s really all about land! Hernando de Soto`s credo to the importance of land is of timeless relevance (de SOTO, 2000). The successful countries will be those that spend their energies ensuring that property rights are widespread and protected by law, rather than those which continue to focus only on economic policy. The global financial crisis has proved his theory painfully and underlines at least the role of engineers for progress and qualitative growth – for real products and values instead of bubbles - of financial behaviour without measure, values or morality. Thus we have to make clear that engineering disciplines, especially in the field of surveying, are characterised by a solid professional-ethical basis. Accordingly, issues and virtues like sustainability and reliability are important to us as a code of conduct. We generate real and lasting values in terms of solutions. 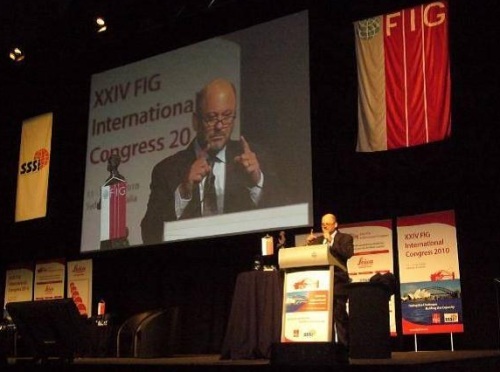 Tim Flannery, one of Australia`s leading thinkers and writers and an internationally acclaimed scientist and conservationist (FLANNERY, 2005/2008), gave us a clear message to take with us as well as a performance order in his great keynote speech at the FIG Congress in Sydney, 2010. The way he sees it, surveyors are custodians of an enabling technology that is critically important for the future. Surveyors should take a leading role in monitoring environmental processes – namely climate change and in explaining it to a broader public. Indeed, a pleading for pro-active communication of our strengths and potential. 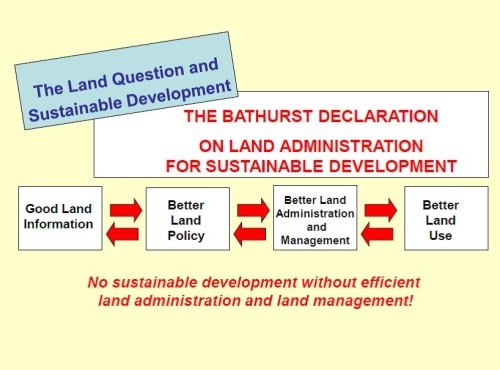 The Bathurst Declaration of FIG and the UN, 1999, focussed on the close connection between the land question and sustainable development: No sustainable development without efficient land administration and land management. This especially applies to facing environmental issues. 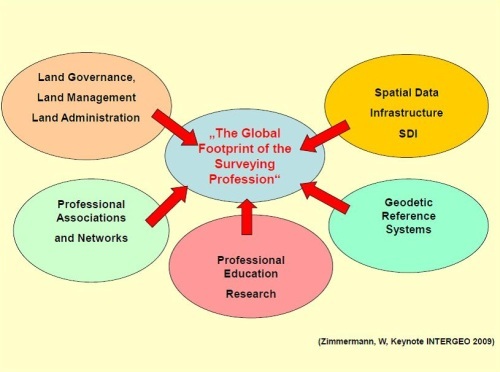 Willi Zimmermann, a well respected German consultant, emphasized in his remarkable INTERGEO Karlsruhe, 2009, keynote the necessity of a new Global Governance. Given current estimates of the world population are at 6.8 billion and are likely to exceed 9 billion by 2035, the fight for food, for the preservation of the natural resources of planet earth, the fight against political and economic misuse of power and against the lack of governance in fragile states as well as the fight for justice and against poverty, are paramount. He demands a Global Governance in the meaning of a broadened understanding of “Global Public Goods” including global spatial information about the actual state and development of global resources. - supported by professional associations and networks such as FIG on a global level as well as national associations. Coming back to the global challenges and their relationship with the surveying branch, some practical examples, for relevant surveyor`s activities concerning my professional background as the director-general for land management and forestry in the Free-State of Thuringia, one of the new German Laender (federal states), shall be presented proximately. After the Fukushima disaster the German Government decided to phase-out nuclear power and replace it with renewable energies – wood, water, wind, solar, agricultural bio-gas etc. The radical change of the Energy Policy results in enormous impacts on land use and property. Land management is required for the provision of land for the requisite facilities, for new transmission lines and for ecological compensation as well as for the reorganisation of land ownership and land use, including a participative approach in a close dialogue with the actors on site. Climate Change is in our backyard and adaption strategies are at the top of the agenda of the land management authorities. 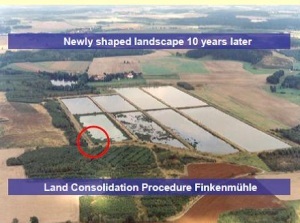 An interdisciplinary study group, established by the German Surveying Association, DVW, has worked out the contribution of land consolidation and land management for facing this challenge. The Demographic Change in Germany (migration, “brain drain”, low birth rate, less people which are growing older) – summarised in drastic words: at first people don`t want to have children and finally they don`t want to die - has amongst other serious outcomes a negative side-effect, namely, that a decreasing population consumes more and more land for settlement and transportation purposes. The red line in the figure below shows the increasing land consumption over the years and at the same time the blue line documents a meanwhile decreasing population. The scissor is opening more and more. As a counter strategy the government of the Free-state of Thuringia has developed a Land Budget Policy. 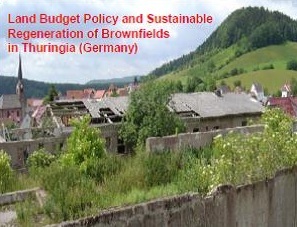 The sustainable regeneration of brownfields instead of the on-going consumption of worthy agrarian land is part of this strategy and is perhaps relevant for all countries in transition. What are we talking about? On the one hand eye-sores in our villages, heritage of the socialist era and synonym for depression, on the other hand worthy agrarian land is consumed for residential, infrastructural or commercial purposes. 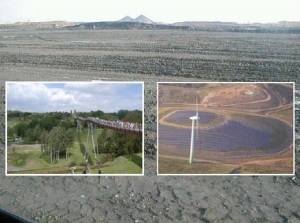 Opencast mining areas in a large scale are under redevelopment. Half of the nuclear arsenal of the former Soviet army was assembled with uranium from the below documented mining area in Saxony and Thuringia. A destroyed and contaminated landscape resulted. 20 years later, after a 5 billion Euro environmental rehabilitation programme, accompanied by sound land reorganisation procedures, flourishing landscapes result. 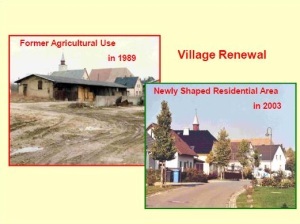 The development of the village center with the help of the village renewal programme prevents land consumption in the free landscape. Environmental protection and the preservation of biological diversity number among the key competences of rural land management. 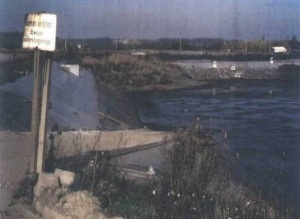 The figure below shows a remainder of the socialist industrialised agriculture: A slurry disposal for a 300,000 pig breeding facility, which originally was a lake. The area was decontaminated and reshaped as carp-breeding ponds and reserves for migratory birds through integrated land consolidation procedures. 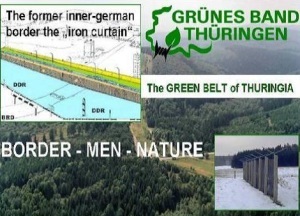 The GREEN BELT of Thuringia, the former inner-German border, the iron curtain, is today a label for a really successful example of both, an integrative and sustainable environmental protection initiative and an example of good governance for regional development. The basic strategy was and is to generate regional development from a sound environmental state in a unique landscape as a value-added chain. The philosophy behind this is to do this with due respect to the historical aspects and to the interests of the local and regional players. A lesson learnt is that surveyors definitely have to improve their planning competences. 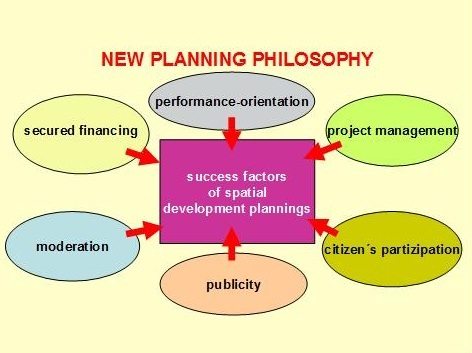 A new planning philosophy is based on the success of spatial development projects – land management in a broad and integrated approach, including moderation, secured financing, performance-orientation, project management, citizen`s participation and, importantly, publicity and communication. Coming back to my introduction: Do well and talk! 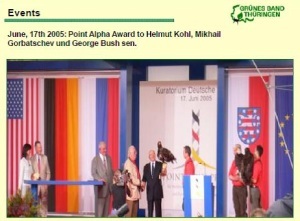 As part of the Green Belt Land Management Project we have organised a mega event with the builders of the German Unity, Mikhail Gorbatchev, George Bush Sen. and the former German Chancellor Helmut Kohl, at Point Alpha, in times of the cold war one of the most dangerous points of the world because all NATO and Warsaw Pact war sceneries were concentrated on this gap, with high troop concentrations on both sides of the border. The heraldic animals of all three nations are eagles and a falconer let them fly over the crowd and they landed on the arms of the three statesmen - a magic moment as well as an effective promotion for the land management project itself. 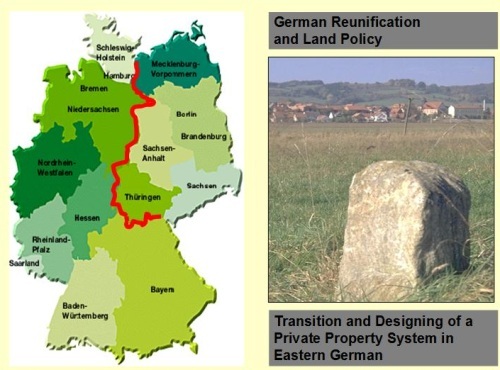 As a best practise example, a private property based land tenure system was successfully re-established after the German Reunification, a significant challenge after the socialist anti-property era. The transition and designation of a private property system in Eastern Germany is a success story which brought the societal relevance of surveyors deeply into the minds of the people. No peace between neighbours, no investments without clarified and regulated property - that was and is the message! 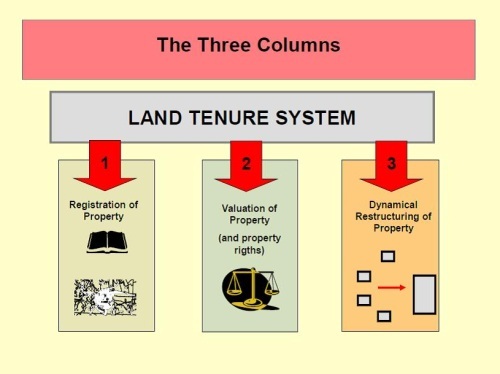 The task included to re-establish all three pillars of a fair, private property based land tenure system: Land Administration, Valuation and Land Management at its best. 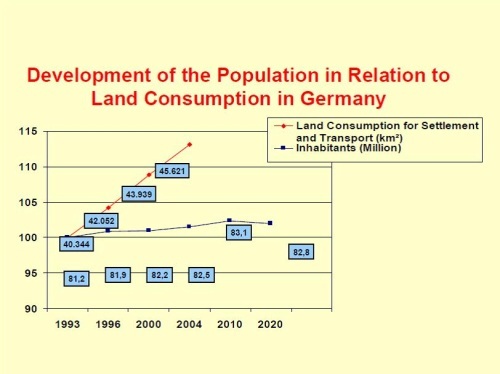 The solution to land use conflicts between agriculture, nature, settlement and infrastructure improvement, which occurred with the ”Infrastructure Projects German Reunification”, i.e., newly constructed west-east transportation arterias, became necessary. Geo is inside of all! 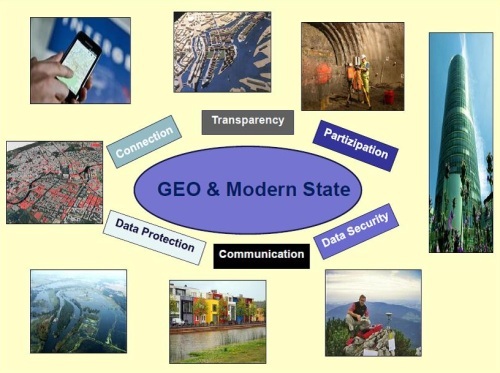 This underlines the relevance of geodetic engagement in the broad field of the modernisation of the society, taking navigation and positioning or policy making in the form of the EU INSPIRE directive as examples. Tradition and Progress – from Pharaohs to Geoinformatics, the motto of the FIG Working Week 2005 in Cairo - for a better understanding of the system men-earth. Our deep historical roots stand for reliability and constancy and are inherent to the ethical basis of the surveying profession. Take a look at NASA´s Brief History of Geodesy - a wonderful trailer on YouTube. Our roots have to coercively become part of a communication and promotion strategy! DVW was established in 1871 as a professional institution and was one of the founders of FIG. Thus, 140 years of experience in successful professional policy is part of our branding and confidence marketing. A long tradition symbolizes stability, continuity, reliability and sustainability as a main feature of our engineering profession. In my view tradition is much more than a nostalgic view back to the past. It draws on a strong internal and outward appearance of a professional association. DVW sees itself as the home of the surveyors in Germany, promoting the sense of belonging together (corporate identity) and acting as a political lobbyist for surveyor`s interests. Professionally the DVW is arranged into 13 independent state associations, according to the statutes. 7 expert study groups deal with state-of-the-art surveying and land management issues on both, a national and global level. 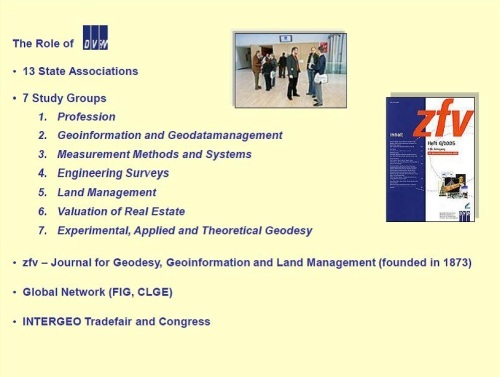 We have published the Journal for Geodesy, Geo-Information and Land Management (zfv) since 1873, one of the oldest technical-scientific periodicals. 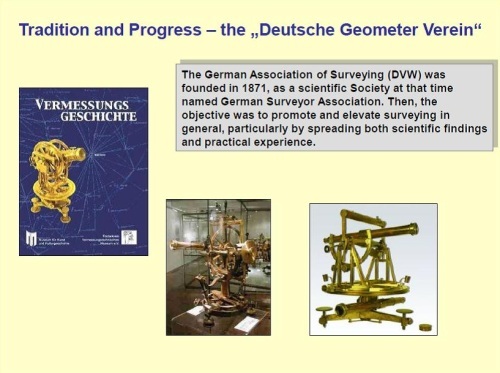 DVW is involved in international matters, primarily through FIG, on meeting the global professional challenges and responsibilities and increasingly through CLGE, the European Council of Geodetic Surveyors, as about 80 % of the applicable law in Germany is EU-made and a strong representation of interests in Brussels is regarded as useful. DVW acts as the organizer of the INTERGEO, which has emerged to become the world’s largest event and communication platform in the developing field of surveying from a multi-disciplinary perspective. Thus, INTERGEO, which stands under the permanent patronage of the Federal Minister of the Interior, is the top brand of DVW and the surveying community. 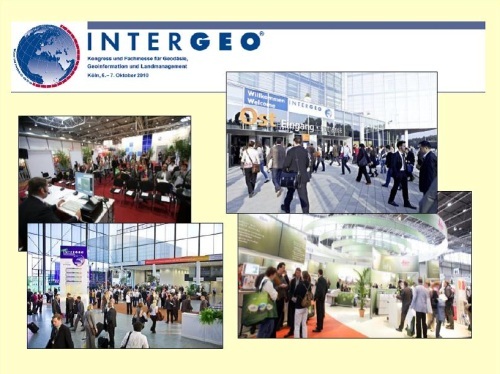 There is indeed no better forum for communication, promotion, discussion and transportation of our professional interests to our partners in policy, economy, government, administration, geo-business, science, education and research than INTERGEO. • the Umbrella Organisation for Geoinformation (DDGI). The final goal is to establish a connected and networking geo-associations community. The appointed range of action includes a stronger representation of common professional interests and joint activities in the fields of further education, recruiting new young professionals, branding, a close coordination in the specialist work of the association committees and the improvement of cross-industry communication. A visible sign is a joint presentation stand of all associated societies which, for the fourth consecutive year, will be in the fair area at this year`s INTERGEO in Hannover, the so-called “Geo-Associations Park”. So the unique benefits of a strong national surveying society with a stabile financial basis, a functioning internal organization and good networks to partner organizations, policy and media are quite evident. This will be achieved through professional lobbying and the capacity for long-term strategic initiatives – like the Brand “Geodäsie” as a corporate identity and label of confidence marketing for all surveying activities in Germany (the German expression “Geodäsie” is not comparable to the English “geodesy”, moreover, it includes the whole range of surveying activities as an umbrella term). 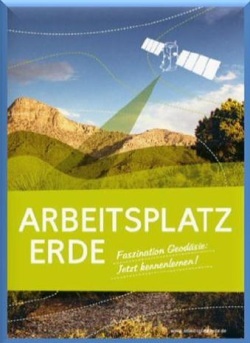 In order to promote our profession`s key societal role and to raise political awareness we have developed a strategy as an integrated part of the Brand “Geodäsie” – an initiative for recruiting qualified young people to our profession, www.arbeitsplatz-erde.de (an English version is available) as an appropriate reaction to a dramatic lack of new recruits for engineering sciences in general, on the one hand, and excellent professional perspectives for Geodesy, Geo-information and Land Management on the other hand. • provided with scientific and practical know-how. We offer answers to the future questions of planet earth and mankind! We want higher acceptance and a better perception of our work and our profession. We need a better internal outcome for our profession! We need more young blood and we offer great job perspectives. We are proud to be surveyors! De Soto, H, 2000. The Mystery of Capital: Why Capitalism Triumphs in the West and Fails Everywhere Else. Basic Books, 2000. ISBN 0-465-01614-6. Flannery,T, 2005/2008, The Whether Makers. The Text Publishing Company, Melbourne. ISBN 9781 921351 822 (pbk). President of the DVW – German Association for Geodesy, Geoinformation and Land Management. Director-General for the Development of Rural Spaces and Forestry, Thuringian Ministry for Agriculture, Nature Conservation and Environment in Erfurt, Thuringia, Germany. Doctorate (PhD) in Engineer Sciences (Dr.-Ing.) at the Technical University of Berlin. Honorary Professor at the Technical University of Dresden for International Land Policy and Land Management. Lecturer at the Technical University of Munich, International Master Course „Land Management and Land Tenure“.